Your busyness diminishes your productivity. When your church does everything, it usually ends up doing few things well. When you get involved in everything or focus on too many things at once, you end up accomplishing less of what you wanted to do. 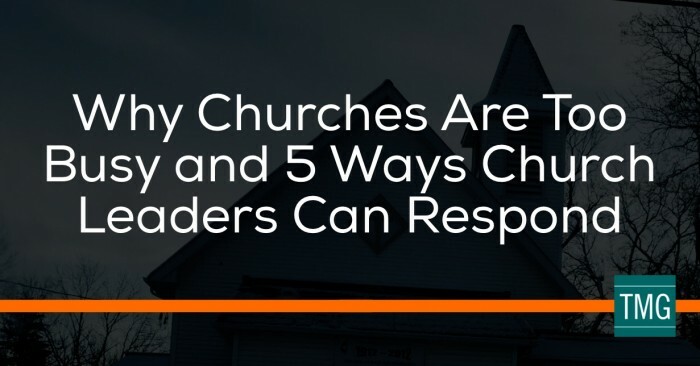 You begin to see that your church lacks clarity which damages the first impression of your church guests and reduces your church’s overall impact. It is fascinating to see so many articles in the news today about the negative impact of multitasking on our productivity. As we try to focus on task after task, Bradberry describes how the part of your brain that handles focus begins to deteriorate. Yes, you read that correctly. Our relentless pursuit of multitasking as a society over the past few years has resulted in our ability to focus. “It’s as if being busy all the time (via multitasking) trains your brain to be mindless and unproductive.” wrote Travis Bradberry recently when discussing productivity and multitasking. His research which looks primarily at individuals also seems to apply to organizations like your church. As your church seeks to grow its impact, you add ministries, get involved in new opportunities, and do more in hopes of accomplishing more. You begin to see more people in worship on Sunday mornings, in small groups, and serving in the community. You celebrate the way it appears that your church is not only growing numerically but also growing its transformational impact in the city. But you know as well as I that doing more does not necessarily lead to the results you want. Your church can do 100s of things and still find itself stagnant in terms of impact. You can get involved in all sorts of activities that may sound good and even are promoted by other Christian organizations that even still end up without the long-term impact you wanted. You are not the only church leader facing this challenge. You are one of tens of thousands. The key questions you have to ask yourself and your church’s leaders are: How have all your activities kept you from accomplishing the mission of the church? How can you apply this research on individual multitasking and productivity to your church? You’ve learned this lesson at some point in your life. If you are like most people, you’ve learned it multiple times. What if you applied this lesson to the church? What would it look like if your church admitted that it didn’t do everything well? Try to focus your church into being about something. The goal here isn’t for you to say to the world, “Look at us!” But it is worth asking what you and your church are known for in your community? What would you like to be known for? The reality is that you are known for something already. As you focus and get painstakingly clear about what that focused ministry will look like, your church’s vision will take shape in ways that it hadn’t before. Rather than talking about vision and forgetting about it in order to go and do more and more ministries, you will shift from vision deficiencies to vision execution. Sometimes your church may resist the idea of going deep in one area. But why is that? Why do we somehow have a knee-jerk reaction to focusing on one thing, one ministry area, or one segment of the community? Deep down you and your leaders may want to make sure that you don’t miss out on opportunities to bless others, to follow God’s leading, or to live on mission. You shouldn’t be morally against any of those. But what if you focused on going deep in one segment of your community? What if you were to get your church unstuck by breaking some of your internal barriers? A case in point would be a local school. Imagine your church is located in a Kansas City suburb with thousands of homes packed into neighborhood after neighborhood. These neighborhoods are full of children and students that attend a local elementary school. But you notice that the elementary school needs some improvements as far as the facilities, reading scores, exhausted teachers, and a host of other things. What would happen if you decided to reduce your church’s activities in other areas around the city and focus deeply in this one school for the next 2-3 years? How could you bring about change? What would happen in your church? Who are the people you might see joining your church on Sundays in abundance? You see diving deep doesn’t mean that you can’t have a wide impact. In Andy Stanley‘s book Deep and Wide he discusses the friction between not only making a transformational impact in a few people (deep) but also reaching increasing amounts of people (wide). Some of the same ideas apply to this local school example. Diving deep in one school doesn’t mean that you have constrained yourself or your church to the point that you can’t make a large impact. It actually lays the foundation for impacting many, many people. As you impact a few on a deep level in a given context, you will begin to see large numbers of opportunities open up to do more of the same. You will see teachers at the school who look to the church as a partner in their goals of impacting kids. You will see families interested in visiting your church services because of the way your church has invested so many hours in improving their school. You will see a transformational impact in the city that is both deep (at one school) and wide (impacts families, staff, students, businesses connected to the school, and much, much more). So what are some common strengths or interests throughout your church? Have you noticed that your church gravitates towards certain types of ministries? Have you discussed these types of questions with your leaders? Identify what types of gifts, passions, strengths, and abilities the people of your church have. Chances are that you will see all sorts of different gifts and abilities. This doesn’t mean that your church is defective. It means that you are the body of Christ and your varying gifts represent the diversity of God’s creation. But you will see some commonalities between the various strengths. You may even start to notice that because of a certain industry in your city God brought you all together around a certain skill set. You may notice that due to your location in the community, your people have a common demographic background, interest, or ability. Forcing your church on a part of the community that doesn’t want your involvement isn’t wise. Nor is it wise to push your church to do something that it is under equipped or not interested in doing. Look for where your church naturally gravitates and easily connects. The people in your church have networks of friends, colleagues, families, and all sorts of other connections in the city. Your church likely already tends to drift towards doing similar sorts of things. Now it is your turn to identify where your natural niche is in the community. If it isn’t natural, it will feel forced for you, your church, and for the community. Find common sense ways to dive deep in the community using relationships you church already has, passions God has given you, and serving others where there is a clear need. As your church grows, there is a tendency to drift little by little away from what you originally planned to do. Your church may have drifted slightly away from its target or it might be so far out to where you are involved in 15-30 different ministries in the community with no sense of cohesion or focus. Either way, you will have far greater success impacting people if you focus on some location, group of people, or tangible need. Churches are too busy (often doing good things that aren’t the best things). We all know that. But I’m not focused on churches in general. I’m focused on your church. Your church can’t do everything. You can’t either. Become a church known for it’s impact in some area. Not so that you can get all the attention or say “look at us” but so that you can maximize your impact for the kingdom of God.